"In the year I have known Amy, I have referred her to a few friends and family members and they all rave about her service, professionalism and sweet personality." I, Robyn Ayers and my family spent the last few days visiting Walt Disney World in Florida. 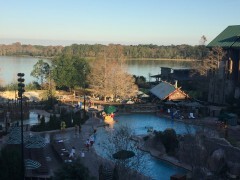 This year we stayed at Disney’s Wilderness Lodge located in the Magic Kingdom area. The hotel is inspired by America’s Great Northwest and has a woodsy theme. The beautiful lobby features a stone fireplace and towering totem poles. A hot spring originates in the lobby and continues outside where it turns into a roaring waterfall. There is a great pool area including a splash pad area for younger children. At the water’s edge, you will find Fire Rock Geyser which erupts every hour from 7AM-10PM. The location is perfect and just a 10 minute boat ride to Magic Kingdom. The hotel is undergoing construction of new villas for the vacation club and some overall refurbishments at this time. Disney works very hard not to inconvenience the guests at the resort and the impact we felt was minimal since the work took place while we were enjoying the parks. We spent our first day at Epcot. We rode the new Frozen Ever After ride which was great and my nieces loved it. As soon as we got off the ride they got in line to meet Elsa & Anna. There are no longer fastpasses to meet them but the line was only 25 minutes long. There are fastspasses for Frozen Ever After so if you would like to ride without a long wait choose this as your fastpass option. We also rode the new updated version of Soarin’. We really enjoyed the around the world version and I personally like it more than the original. We had dinner tonight at Chefs De France. The food and service was wonderful…I highly recommend it. We spent our second day at Magic Kingdom. This has always been our favorite park. There is so much to do for everyone. We rode all of our favorite rides including Big Thunder Mountain which we rode 5 times throughout the day. If you love this roller coaster as much as my family does be sure to ride it at night. It changes the whole experience and it is our favorite time to ride. My nieces watched the Country Bear Jamboree, met all of their favorite princesses and we even had time to visit all of the great stores on Main Street. We had dinner at Crystal Palace which features Winnie the Pooh, Tigger, Piglet and Eeyore. After spending time with Pooh and friends we headed to Main Street to watch the Wishes fireworks show. As always it was great and a perfect end to our day at Magic Kingdom. After two great days at Magic Kingdom and Epcot we spent our last days at Animal Kingdom and Hollywood Studios. Animal Kingdom has just recently begun staying open at night which we really enjoyed. We rode Kilimanjaro safari in the dark which was really fun. We saw quite a few animals and the artificial moonlight is very cool. We enjoyed the park at night and even the Tree of Life lights up and has awakenings with a short video every 10 minutes. We will definitely be adding a nighttime visit to Animal Kingdom for all of our upcoming trips. Hollywood Studios has recently added a few new Star Wars shows including A Galaxy Far, Far Away which is a live stage show and Star Wars: A Galactic Spectacular a nighttime fireworks show. These are both great additions to the park and we also enjoyed many of our favorite attractions. We love Hollywood Tower of Terror, Toy Story and Rock N Roller Coaster. We also enjoyed the new Frozen singalong show. Both parks have some new and exciting additions that are under construction. At Animal Kingdom, Pandora- The World of AVATAR, has been under construction for a couple years and is now slated to open in May. Pandora will feature a family friendly Na’vi River Journey, sending riders through a bioluminescent rainforest. Avatar Flight of Passage will offer guests a thrill-ride experience of exploring the world of Pandora atop a Banshee. Hollywood Studios has begun construction on Star Wars Land and Toy Story Land. This will bring some new and much needed attractions to the park. Star Wars Land will be Disney’s largest single-themed land expansion ever at 14-acres, transporting guests to a never-before-seen planet, a remote trading port and one of the last stops before wild space where Star Wars characters and their stories come to life. There will be two new signature attractions but does not have an official completion date and the rumored completion date is sometime in 2019. Toy Story Land which is also set to begin construction and will allow guests to explore Andy’s backyard. This will feature a new family friendly roller coaster and alien swirling saucers. There is no completion date at the moment but it is expected to be completed after Star Wars Land. The next few years at Disney parks are going to be filled with new lands and attractions. Now is the perfect time to plan your next Dream Disney vacation. As always contact your favorite Dream Agent and start planning today!